One of my favorite memories from our trip to Chile in January was venturing up the active (though resting) volcano Osorno. We took a chairlift from the base and then hiked to the highest spot you can reach without climbing gear. I was awed by the contrast of the red and black pumice against the lazily lifting clouds, and the deep ruddy browns that bled out of the blindingly white snow at the peak. It was heartbreakingly beautiful. Being summer, the melting snow was dyed with the colors of the earth, and trickled down the slopes in sloshes of dirty runoff. It was up here, as I stood overwhelmed with the beauty of the land - that I also learned I have a relatively overpowering fear of landslides. As the snow melted, it cleaved and cracked over the wet earth and started a few small pebbles rolling down the face of the volcano. Which of course I immediately imagined would turn into a raging pyroclastic landslide. After taking a bunch of hasty photos at the crest, my voice can be heard in Dan's video whispering forcefully and laden with fear, like something out of a B movie... "We need to get off the volcano. Now." Now it's a funny story -- but then the fear was real, (Rather silly I admit, but still real) which is why I think this particular expedition stands out above the others. As such, I had been wanting to do a painting from that experience (though focusing on the abstract beauty of the place, and less on my irrational fear...) and made a bit of time last weekend to organize my sketches and photos from that day. 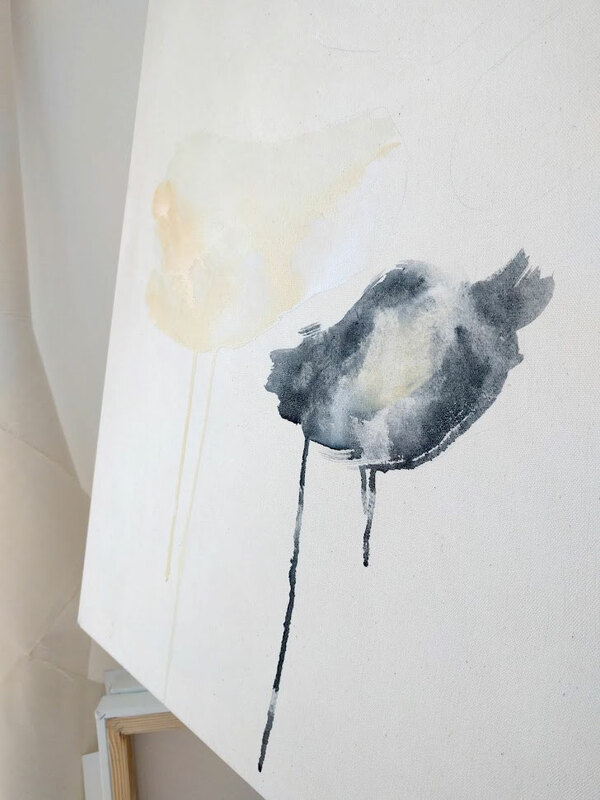 I selected a freshly primed linen canvas (follow me on snapchat to see how I make them : LemonSherman) and tried to get into the headspace I remembered from our journey up the slope. I was able to wrap up work on this yesterday, and am now just waiting for the sun to come back out to seal the piece. I love shiny wet watercolors. Recent work - dried and sealed.